If you love cycling it’s likely you will be disappointed when winter arrives as it could mean less time on 2 wheels. It really doesn’t need to be the case and we have put together some helpful points to keep you cycling whatever the time of year or weather. The main point to remember is if your clothing and equipment is right you can enjoy riding all year round! Staying warm and well fuelled are two key points to maximise winter fun, being seen by other road users and prolonging the life of your equipment are also important considerations which we cover in part two of this blog. Wind, rain, temperature and your route will all play a part and your wardrobe may vary significantly depending on the conditions. While you want to stay warm, you don’t want to get overheated. Damp clothes from sweating heavily will cause you too cool down rapidly when the exertion drops or you need to stop. It’s a careful balancing act that you’ll perfect with practice and experience. Carrying a spare, dry, base layer in a plastic bag in your jersey can be a real life saver at a coffee or food stop. Food – Obviously the right clothing is hugely important but often overlooked is the need to stay well fuelled, your body needs food to produce the extra energy required to battle the elements and maintain body heat. Our friends at Tailwind Nutrition have some great options to keep you fuelled and help you recover. Base Layer: A thermal base layer that wicks away moisture is an invaluable part of your kit, Merino is a great option as it stays warm even when wet. Bib Tights: Full length and fleece lined, look for versions that offer a little bit of weatherproofing. Many manufacturers produce items of clothing that use lycra that has been treated to give a good level of water protection (pay particular attention to the washing instructions). They won’t keep you dry in prolonged heavy rain but they will protect you from showers and wet roads. Windstopper fabric in key places like the knees and front of the thighs is another great addition well worth looking out for when preparing for the colder days. As with any cycling shorts a good quality, well fitting pad is essential to your comfort and well worth investing a little extra cash for. Long Sleeve Jersey: Get yourself a good quality fleece lined winter jersey. You can use it either on it’s own on milder days, with a thermal base layer for extra warmth or as part of a layering system under a jacket when the temperature really plummets. Light weight wind and waterproof jacket: Ideally find yourself a jacket that folds down small enough to pack into a jersey pocket. That way it won’t be sat in your kit bag at home when you really need it. For milder days when you know there’s no rain coming a good gilet is a great emergency layer to have. Their lightweight packability and wind protection makes them highly versatile, coupled with a pair of arm warmers they make a great back up option or an easy and packable layer to start an early ride when you know it’s going to warm up later on. Gloves: There are so many options here from thin fleece gloves to full on thermal winter varieties. Wind and waterproofing are two key things to consider. Unfortunately, like so many other things it’s hard to find one pair of gloves to cover all bases. It is likely you’ll end up with a small collection and then the dilemma of which ones to choose on a given day! Overshoes: Once again there are numerous options and variations available. At one end of the spectrum there are lightweight covers offering minimal protection from the elements, at the other full on heavy duty winter boots. We’ve still not come across an overshoe that won’t eventually let in water after long rides in heavy rain but the key thing is that they’ll keep the wind out and provide a good amount of warmth even when wet. Thin neoprene boots are a good choice, offering great insulation and wind protection in a well fitting and low bulk package. Key things to look out for are a good fit around the leg to prevent water running in and hardwearing/reinforced areas of material around the underside, particularly the heel, so that they don’t wear out too quickly while walking off the bike. Hat: With modern helmets offering exceptionally good levels of ventilation, losing heat from your head is a big problem on cold, wet and/or windy days. A good hat will be a huge asset when out during the colder days of winter. A thin thermal skull cap that fits under your helmet is a great addition to any winter kit. The more traditional peaked cycling cap while generally not as well insulated is a great way to keep the rain out of your eyes in warmer but wet conditions. Many helmet manufacturers now offer Aero covers for certain models of their helmets, often made of clear perspex and designed to cover the vents in your helmet. while not specifically designed for this they are a fantastic way to turn your helmet into much more effective rain protection. beware though, you will overheat much quicker due to the lack of airflow. At least two inner tubes and a small puncture repair kit for emergencies. Tubes aren’t much use without a pump so you’ll want one of those too. Food. Energy bars, homemade snacks, Bananas, whatever your preference make sure you carry something. Your body will burn far more fuel than in the summer months just trying to keep itself warm. A waterproof phone/wallet case. Protect all your valuables with a miniature dry bag or even just a heavy duty zip lock bag. even if the forecast is good you can never be too careful with that expensive smart phone. If the forecast is iffy pack your light weight rain jacket, If you’re confident its good then I’d always recommend a Gilet and Arm Warmers for a winter ride. If you get stranded for some reason it’s always good to have an extra layer of some sort as back up. Don’t forget a little bit of cash for an emergency cafe stop if you run low on fuel or just want to get out of the elements for a while. 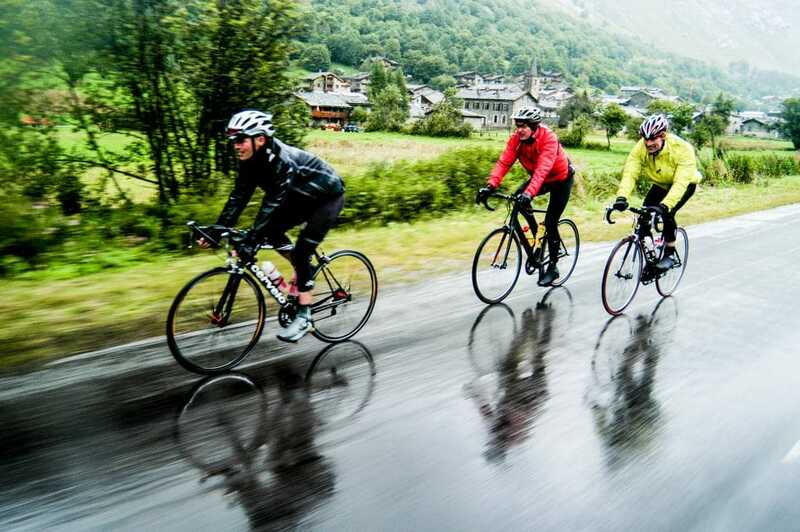 If you’re planning a trip to the alps, take a look at our 8 essentials for road cycling in the alps and get in touch to find out about our day trips and tours.